The last match of the year for me and an outing to Lawn Farm near Cambridge with the Facebook Angling League guys. Lawn Farm has been quite kind to me this year although the very cold weather lately made me think that today would be a tough day. 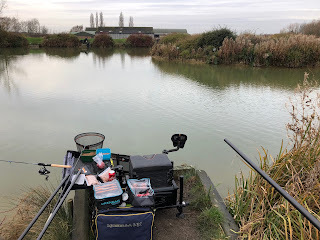 I'd pinged Amer Jawad who is a local (although not for much longer) regular at Lawn Farm for some advice as I'd not been on the bank for a few months to get some tips. Amer certainly helped my day, so thanks Amer! A couple of now shows, although the best no show was Glen who thought the match was on the Sunday, not the Saturday! Luckily Paul Law who was getting a lift from Glen arrived with another angler. On the plus side at least Glen didn't turn up at some ungodly hour at Paul's place on the Sunday! Peg 27 came out the bag for me which I was happy about. The peg is on the spit at the back of the lake and gave me open water and the island to go for.